In the 2014 sci-fi cliffhanger Interstellar, a crew of gallant astronauts travel through a time-space warp in search of a new home for tellurians, as earth is no longer suitable to sustain life. If you thought living outside the green planet is just a thing of science-fiction, meet Igor Ashurbeyli, who last month announced the birth of the world's first space nation Asgardia. He proclaimed himself to be the father of the nation state in the space and is currently working on the modalities of establishing life and a rule of law in the proposed Nation. Asgardia seems to be inspired from Asgard, which, according to the Norse faith, is one of the nine worlds and is the country of the gods. A Russian businessman and scientist, Ashurbeyli is a doctor of science in engineering and also has a PhD in engineering with specialisation in Computer Science. What he has proposed is, literally, out of the world. Ashurbeyli has sought the recognition of Asgardia from United Nations and in the meanwhile, has called for applications for citizenship of the proposed nation. Yes, you read it right. 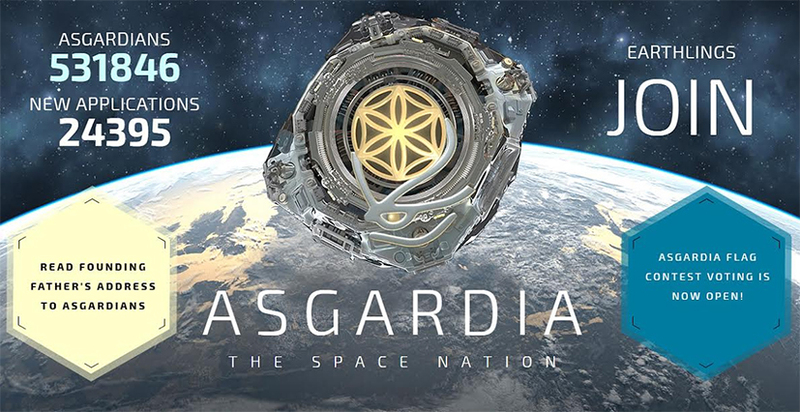 Asgardia has already got over 5,31,000 registrations, according to its official web site. That makes Asgardia the 169th most populous country in the world just above Cape Verde even before it gets recognized. The registrations for Asgardia include over 11,770 Indians and growing. The site indicates that the first one lakh people will get preference for citizenship of Asgardia. Ashurbeyli says on the website, "it is the realisation of man's eternal dream to leave his cradle on earth and expand into the universe". Like Asgardia, a similar project, called Mars One, was launched in 2012 by Dutch entrepreneur Bas Lansdrop. Mars One proposes to take earthlings to Mars and establish a human colony there by 2026. Another man who is stretching the barriers of space and human imagination is Elon Musk, who is working on the idea of life outside earth through his space-tech firm SpaceX. Observers are keenly watching these developments even as they seem more fictional than real for now. "Asgardia is still in early stages and we will have to wait and see how it develops," says Rahul Narayan, fleet commander of Team Indus, a Bengaluru-based firm, which is building a privately-funded spacecraft for landing on the moon. "There would also need to be a lot more information to gauge the seriousness of those behind Asgardia," he adds. A detailed questionnaire sent to the Asgardia team by Techcircle did not elicit any response. Meanwhile, Ashurbeyli and his team are working on developing an insignia, a national flag and an anthem for their proposed space nation. The team, post recognition from the United States, aims to set up embassies of various countries and also wants a "space law" which will not be like a "law of the jungle". "Today, only 20 countries on Earth out of about 200 have a space presence, and have, for example, plans to mine in space and lay claim to exclusivity and monopoly. New space law has to equally protect the interests of every human being on Earth," Ashurbeyli said in his address at the time of the announcement of his project. Even as Ashurbeyli's pronouncements sound fanciful for now, observers feel such attempts will pave the way for serious conversations around probability of human beings travelling to the space. "The larger impact of the current conversation around Asgardia, at least initially, will be the normalisation of conversations on such topics. That will only catalyse efforts to make humans spacefaring," says Narayan. Asgardia has announced three scientific and technological goals. First is to ensure "the peaceful use of space". The second is to protect "our planet from threats from outer space". And the third goal, according to the site, is to create a demilitarised and free scientific base of knowledge in space. "This will provide free access to all, especially those from developing countries who do not have space access now. And such access should be free and direct". Does this sound utopian? "Yesterday's utopia is often today's reality. Ever imagined what Christopher Columbus would think of Elon Musk," asks Narayan.